Students and alumni often refer to Castleton as their home away from home. This is especially true for those who have lived in Ellis Hall, a hallmark among Castleton’s 11 residence halls and one of the oldest buildings on the university’s campus. Perhaps the most charming things about Ellis Hall is its history. Over the years, it has transformed from an all-female dorm to the stomping ground for first-year students. Ellis Hall — which bears its name in honor of George Ellis, a railroad magnate whose estate was on Glenbrook Road — was constructed in 1951 when Castleton was known as Castleton Teachers College. Nestled on a hill on South Street, Ellis became the second women’s dorm on the college’s campus. It originally housed 126 students. Leavenworth Hall, located in the footprint of the current academic building with the same name, was the older of the two dorms (built in 1926) and housed 60 students. On a cold, mid-winter’s night in 1971, Leavenworth Hall burned down. 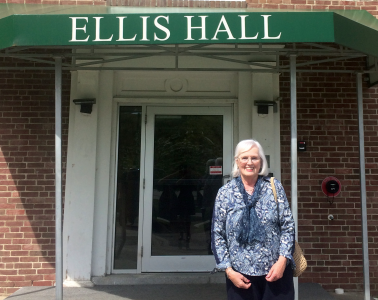 Ann Baskind ’68 came to Castleton State College from Westchester County, New York and lived in Ellis Hall when it housed only females. She soon became friends with the other freshmen who resided on the third floor’s south wing, which they affectionately refer to as Three South. 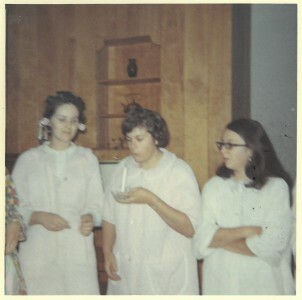 Life in Ellis was different — and certainly simpler — back then. Baskind said that each floor included a phone room, which contained a single pay phone that students could make collect calls to home from. She also said that students were required to sign in and out every time they came and went from the dorm with a desk aide. Men were only allowed in the girls’ dorm rooms under special circumstances, such as to help drop luggage off during move-in, but public displays of affection thrived in “the fish bowl,” or the porches and lobbies of the female residence halls where men were allowed. “I remember when the lights flickered outside, you better be in that dorm,” she said. Those flickering lights refer to the college’s curfew system for women, which included an 11 p.m. curfew Sunday through Thursday and a 2 a.m. curfew Friday and Saturday. 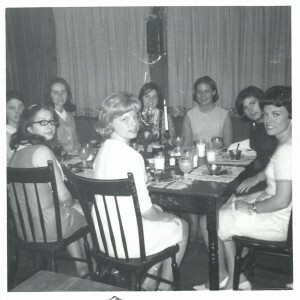 The curfew system was abolished in the fall of 1968 for all women except first-semester freshman. Baskind also remembers Sophie Cassin, the Ellis dormitory director who was named Vermont Mother of the Year in 1965 by the American Mothers Committee, a program created by Eleanor Roosevelt in 1931. The Mother of the Year award is awarded annually at the state and national level to a woman who embodies the traits highly regarded in mothers and displays the ability to strengthen family relationships. Cassin was 69-years-old when she received this honor, and had been responsible for the roughly 120 female students housed in Ellis for six years prior. The women who called Ellis home were also known to create traditions. What sticks out most to those who lived in Ellis was how easy it was to make friendships that have now spanned more than 50 years. Ellis Hall transformed into a co-ed residence hall in the second half of 1977 with the addition of an annex wing that housed 16 males. However, Ellis still mostly home to females, with 130 women living there in the fall of 1977. 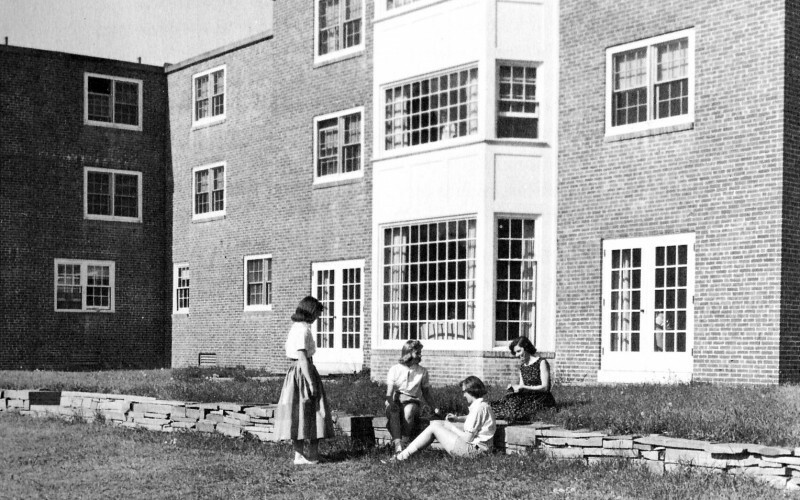 Over time, more men were moved into Ellis until it became a co-ed residence hall, as it remains today. In the early to mid-1990s, Ellis Hall became a dorm traditionally reserved for freshman and was known for its rambunctious residents and frequent fire drills. While the mischief eventually returned to the normal level that’s expected in a college dorm, rumors of a haunting in the hall ramped up. The common belief that Ellis is haunted has become a popular story told to each year’s incoming class. Tales of spontaneous flushing toilets, running water, and random footsteps are shared. But like most ghost stories, proof is hard to come by. Today, Ellis Hall houses up to 144 students with the same corridor-style charm it’s always been known for. During the 2017-18 academic year, Castleton recognized that housing assignments based on gender alone may not be appropriate for all students and began offering gender-inclusive housing. The first floor of Ellis is one of three residence halls on campus that include gender-inclusive housing, a stark but welcome contrast from the days when it housed all women. While there are many things different about living in Ellis Hall today than when Baskind and her friends resided there, Ellis’ ability to help cultivate friendships remains. For St. Marie and many others who reside in Ellis, living there is what you make it.